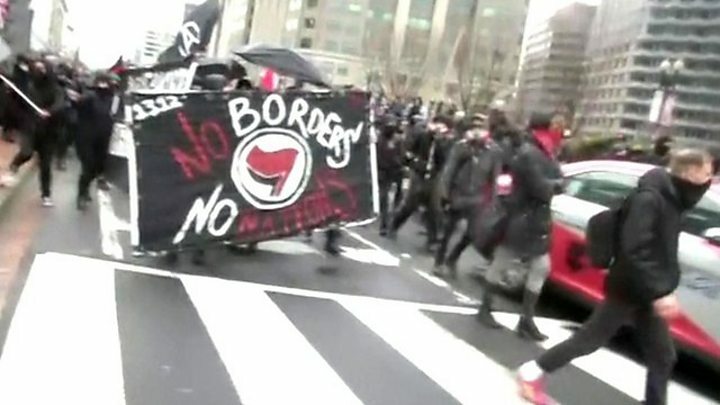 Just before Donald Trump's swearing in, a group of a few hundred black-clad, balaclava wearing protesters carrying anarchist symbol flags began a fast-moving march through downtown Washington, just blocks from the inauguration. One large sign read, "Make Racists Afraid Again". The march turned violent, with people in black bloc smashing business windows and upending trash cans. A large number of helmeted police with nightsticks moved to drive them away, but many of the marchers ran, continuing to make their way through the streets. Eventually they were corralled together by police and there were reports of arrests. Members of a Washington group called DCMJ began handing out free marijuana to promote legalisation and protest Trump's pick for attorney general, Senator Jeff Sessions. Sessions famously once said that "good people don't smoke marijuana", and at his confirmation hearing would not commit to not enforcing the federal ban on marijuana in states that have legalised it. Small amounts of marijuana are free to posses and distribute in Washingon, DC. DCMJ members passed out rolled joints from inside a fake prison cell, draped with a sign that read "Jeff Sessions is Backwards on Marijuana". Several groups including Black Lives Matter, environmentalists, LGBT rights activists and many others staged sit-ins that blocked revellers from check points leading to the inauguration. Some demonstrators even chained themselves to gates. Trump supporters were still able to gain access to the Inauguration through other checkpoints. Nancy Pelosi and other House Democrats will be wearing matching blue buttons that say #ProtectOurCare, a reference to the Affordable Care Act, which is under threat of repeal under the new Administration. Pelosi tweeted that the buttons are "symbol of our solidarity and support for the ACA during today's inauguration". Several female legislators also plan to wear pink "pussyhats" to the inauguration. The knitted hats will be worn by hundreds of protesters at tomorrow's Women's March and are a reference to Trump's vulgar comments about assaulting women. Image caption The view of the mall from 12th and Madison Streets in Washington, DC as Donald Trump gave his inaugural address. Many citizens chose to register their protests by sitting out the inauguration. Where crowds packed the parade route and National Mall to watch the swearing in of Barack Obama, there were noticeably empty patches during the Inauguration ceremony. Meanwhile, the DC's transportation authority tweeted out ridership statistics: 193,000 people took the metro today, compared with 513,000 when Obama was inaugurated in 2009 and 317,000 when Obama was inaugurated for his second term in 2013. It was even less than the 197,000 who rode to see George W Bush inaugurated in 2005. Meanwhile, journalist Brian Stelter asked his Twitter followers to send pictures of how they were watching the inauguration. Several responded with images of turned-off televisions.